Sorry folks, I switched blog platforms a while back. Want to make sure you're finding me over at www.arikhanson.com. And, if you're so inclined, drop me a note or comment and let me know what you think of the new design/theme. I'd appreciate your feedback. In the meantime, thanks for reading. Hope to connect soon. The following is a guest post from my PR colleague and good friend, Scott Hepburn. If you'll recall, a number of folks participated in a tweet-a-thon a few weeks back in hopes of generating job leads for Scott and Sonny Gill--two eligible "free agents" at the time. Arik Hanson is MY ambassador of Quan. Just one month ago, Arik called on you, his readers, to join him in Tweeting me into a new gig. And you responded. In overwhelming, breath-taking, faith-affirming fashion, you responded. Hundreds of retweets. Dozens of leads. Countless inquiries. And momentum. It seems only fitting that I would circle back to Arik’s blog to announce that my free agency. This week I joined Ritz Marketing in Charlotte to lead their social media and emerging media team. I’m excited to join one of Charlotte’s top five agencies. Ritz Marketing clients include the Detroit Area Honda Dealers Association, Penske Automotive Group’s Central Zone Division, McAlister’s Deli’s largest franchisee, and dozens of others. You, the generous members of Arik’s community who had my back when I was looking for my feet. You, the PR, marketing and social media groundbreakers who teach me something new every day. You, the forward-thinkers who are coaxing, prodding and leading your companies toward the future of communication. Thank you for your support, guidance, leads, offers, and generosity. Though we may yet be strangers, you treated me as a brother, and for that, my door is always open to you. 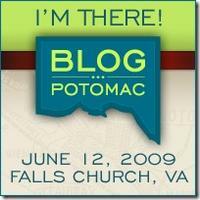 If you’re headed to BlogPotomac, find me. Let’s connect. You’ll find me with my agent, Arik Hanson. As you may know, I spent a few days this past weekend down in the U.S. Virgin Islands. Of course, we spent a fair amount of time lying on the beach. 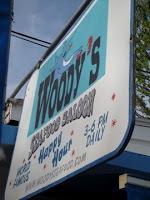 But one of our favorite activities while we're on St. John (our favorite island, in case you're wondering) is Woody's "World-Famous" Happy Hour. Yes, world famous. On an island that's known for outrageously high prices on everything from gas to orange juice, Woody's offers $1 beers and well drinks from 3-6 every day. Every day. What's more, they offer an electric, college-like atmosphere you simply can't find anywhere on St. John OR St. Thomas. Quite simply, it's been a staple of all our trips to St. John. And we tell anybody who will listen to go there, too. Why do we refer so many folk to this hole-in-the-wall bar? We have yet to have a bad experience. In fact, it's often the most fun we have on our trips. 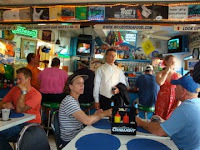 We sit at the bar, chatting with the bartenders and locals. Wait staff pass us shot glasses with tastes of their frozen concoctions. And they pump in great music throughout happy hour. The place just has a vibe. For us, it's all about the unique experience Woody's offers. Heck, I even bought a t-shirt (the true sign of an exceptional experience). Keep in mind, Woody's isn't on Twitter. They don't have a Facebook page. They haven't presented me with any marketing materials. And I haven't talked to a single salesperson or PR rep (although I do try to chat with one of the owners when I'm there). What's the lesson for brands here? It's all about the experience. Without an exceptional experience, all the social media, PR and marketing efforts in the world won't mean a thing. In this case, Woody's nails it. The bartenders and wait staff are incredibly efficient (I always have at least one drink in my hand at all times), friendly and funny. The drinks (i.e. "products) are always cold and delicious. Heck, they even have a "drive up" window where you can grab a drink "on the go" as you're passing by. They also have all sorts of sports and island memorabilia inside to check out. And the food ain't half bad either (conch fritters anyone?). It's a total experience--every sense is satisfied. Now, should Woody's be engaging me to further their brand? Probably. Wouldn't take much really. But, I'm guessing in this case, they're probably not looking to open up multiple branches across the Caribbean. Regardless, they've developed a unique product and service that promotes itself. There's something to be learned from that simple fact. But most brands could learn a lot from Woody's. Focus on your product or service. Strive to provide an experience that's so out-of-this-world that your customers will leave raving. And work every day to hone that experience so it's always improving. Your brand does all this and it will make marketing and PR's job all that much easier. Enough about Woody's--what's your organization doing to create exceptional products and services for your customers? Now, I want to be clear that I’m not saying that all the wonderful PR people I know aren’t talented, brilliant, and dedicated professionals in the truest sense of the word. But when it comes down to it, our goals often rely on taking a message (from our employer, a client, our own) and finding a way to connect it to an audience that we want to reach and engage. Not rocket science. There’s a simple tip that I learned from a great mentor—“So what.” That’s it, from the audience perspective I want to be able to give them a good answer when they ask “so what.” I need to deliver the important part of my communications in a clear, simple manner that gives them a personal answer to that question and gives them a motivation to spend their time and remain connected with what I’m saying. Now, in an era of more communication channels than ever before, how does this concept change? 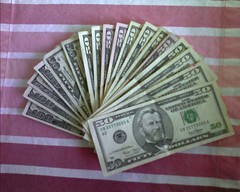 Not that much. When looking at how to engage customers or supporters via social media or Web 2.0 the concept remains the same though the method of engagement changes dramatically as we have a chance to connect more directly with our audience in real-time. Before creating a massive SM campaign that hinges on a new promotion, adding dedicated SM staff, or building a new Web site with enhanced functionality think first about how you can add value to your audience. · What does your audience already know? What is their experience which will shape how they interpret your message? Think about things like history with your brand/competitors as well as regional or cultural elements. · What do you want them to do? You’d better get this sorted out in a very clear way before engaging in the SM space. Failures in this area can be found everywhere....like when you see five updates a day from someone on Twitter that only includes when they got up and what they’ve eaten all day. If this is the best you can do, please don’t. You’ll only hurt your reputation if you hop online and haven’t thought this question through and figured out how you can actually provide people with a way to engage in a manner that’s good for them and drives your goals. · How is it personal to them? Put yourself in their shoes and answer my favorite question: So what? Run your information through this screen and see if you have a good answer to what you’re adding in their lives. This element is especially true in the social media space. The most successful individuals and organizations online get this point and focus on it consistently. The advances in social media aren’t realized by just pushing content out in one more channel but by adding value to people online in an honest way right where they’re at in their lives. It’s the potential for personal connections that make SM so valuable. However, you need to realize that it can’t just be about your info but rather what about your interests matches those of your audience. If you’d ever like to talk more about the simple premise of communications (the devil is always in the details) just let me know. I would love to hear from you. It isn’t rocket science but it sure can be fun. There are dozens of scenarios for why you may consider incorporating social applications into your latest communications plan. Maybe you're responsible for bringing dynamic brand marketing ideas to life. Or perhaps you're charged with facilitating a response to a situation with potential impact on reputation. No matter what your objective, keep in mind that participating with social tools is an ongoing and holistic strategy in itself, effecting multiple communication channels and disciplines within an organization. A sound strategy for participation will ultimately enable exceptional execution. 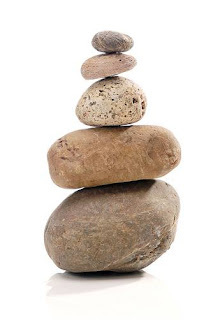 How will you build a foundation for your next communications plan? Does Community lead to Commerce? Before Arik departed for turquoise waters, he posted “Is Social Media Really About Me?” Consensus from comments to that post in my rough observation revolved around sharing, collaboration and making connections. We can all agree that some ego is likely involved. Right? For me, it is affirming when I get retweeted, @replies, or blog comments. It feels great to think that a post I have written compels someone to take time to respond – even in disagreement. I like feeling the connection. I am uplifted by feeling I participated in a conversation that taught me and others something new. Businesses have used mass media. They use accountants. They use raw materials. Social media is not for use. It is for participation. Commerce, as a motivation for community, can easily lead to contrived interaction, superficial relationships and limited desire for customers and employees to engage. I am driven to explain to these organization leaders that authentic/human participation in social media leads to real relationships, passionate employees, and engaged customers. Lack of participation, strategy, and tactics lead to issues like the recent Domino's debacle on YouTube or a loss of connection with the millions of consumers/employees who have come to expect a more personal relationship with brands. In which camp do you fall? Should social media participation and engagement be measured against expenses and sales? Are you one that believes social media can be statistically judged? Or are you of the belief that participation is about relationships, connections, collaboration, and sharing? First off, thanks to Arik for the opportunity to write on his turf. I'm glad to chip in (five years without a vacation?! ), and I hope my little essay below doesn't disappoint. Let me begin with a ray of hope. I hope what I'm about to say is nothing more than preaching to the choir. I hope this writing is simply helpful reinforcement of a concept you're familiar with. If not, don't worry. We're hear to discuss and learn, not to judge or scold. I come in peace! Here's the bottom line: This newfangled "PR 2.0" stuff we're all hearing about everywhere we turn these days is newfangled only on the surface. Yes, helping your colleagues or your clients understand Twitter and its 140-character limit is new. Dealing with the intricacies of blog-comment moderation policies is new. Pitching people (bloggers) who are a lot more likely to publicly shame, rightly or wrongly, PR folks who rub them the wrong way is new. Writing concisely -- and well -- is not new. Dealing with critics is not new. Working hard to make sure your time spent pitching stories is meaningful and fruitful is not new. The platforms, tools and concepts we cluster under the umbrella of "social media" have not changed the core of what PR practitioners do. Not one bit. We have a lot of new tools and lingo and a lot more access to information than we had collectively been accustomed to -- a lot of stuff that's upsetting what had become a comfortable, familiar way of working -- this era of "PR 2.0" is actually just a quick, rough return to what PR always should have been. Yes, bloggers are a lot more likely to publicly ridicule the sender of an off-target e-mail, but is fear of public shaming really your strongest motivation for making on-target pitches? Yes, Twitter and Facebook might seem like utterly foreign territory at times, but wasn't there a time when CD-ROMs were blowing people's minds? It's like Arik wrote in his recent post: PR is a relationship business. Always has been, always will be. Sure, you can get a story placed working with a reporter you've never even heard of, but in the long run, relationships make the work easier. And recently we've seen a clear return to public relations -- not just media relations. Working with bloggers might closely resemble working with magazine reporters, but what about that active twitterer who's constantly talking about your company's products? Or the Facebook wall-post writer who's always keeping you on your toes? Media relations? Hardly. Public relations? Damn straight. So while it's clear that those of us on the leading edge of Web-savvy PR are quickly becoming pseudo-IT pros almost as much as we're pseudo-journalists, the core of PR is still exactly the same: working to establish credibility and foster conversations between organizations and their interested publics. Online or off.